Silvia De Gennaro lives and works in Rome. In the early years of his artistic activity he devoted himself to painting, producing a series of paintings called "Weave". Some works are in private Italian and foreign collections ex. at The National Museum of Modern Art in Alexandria, Egypt, and others have been used in the sets of the movie "Wedding" by Cristina Comencini. In 1999, with the architect Alessio Scarale based ASSAUS, a studio-workshop where are dedicated to the creation of multimedia installations and architectural projects, participating in international exhibitions and competitions. Currently involved in digital art, video art and multimedia. 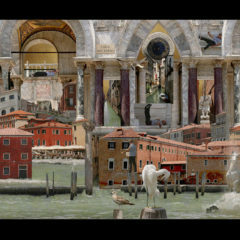 "Venice" is part of a series of works titled "Travel Notebooks". In this project the videos are like carillons and puzzles, that try to show the essence of a town in its manifold aspects and its motion. At the same time, they want to describe the emotional and cognitive process that takes place in the traveller mind. 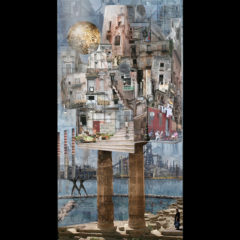 Using details from a photo reportage, I created some digital collages that reassemble the shape of city’s places as they are fixed in my imagination. The details are notes on a traveller pad as fragments surviving in the memory. The animation tries to give back not only lived impressions and influences, but also the points of view of the traveller’s eye, who now focuses on a particular, now on another one, zooming in and zooming out simultaneously, in a way where perspective is not given by scientific rules, but by emotion felt while observing and discovering. Buildings as ferry boats sailing in a busy lagoon busy, populated by birds and gondoliers. "Perugia" is part of a series of works titled "Travel Notebooks". In this project the videos are like carillons and puzzles, that try to show the essence of a town in its manifold aspects and its motion. At the same time, they want to describe the emotional and cognitive process that takes place in the traveller mind. Using details from a photo reportage, I created some digital collages that reassemble the shape of city’s places as they are fixed in my imagination. The details are notes on a traveller pad as fragments surviving in the memory. The animation tries to give back not only lived impressions and influences, but also the points of view of the traveller’s eye, who now focuses on a particular, now on another one, zooming in and zooming out simultaneously, in a way where perspective is not given by scientific rules, but by emotion felt while observing and discovering. 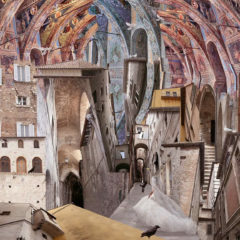 Perugia is a weave of streets, it raises and falls, in the absence of time. It 's a magical three-dimensional chessboard where shafts of light alternating with shadow cones, showing whether the soft pink of stone or the dark damp of time. Perugia is the fertile womb of a woman, the cellar where the more precious wine is hidden. "Taranto" is part of a series of works titled "Travel Notebooks".